I'm having a difficult time making Yotsugi "spin" the other direction. Yotsugi's episode made sure you had a big helping of "Yay, yay. Peace, peace." Araragi made sure he got the best angles while talking to Yotsugi on a staircase. Yotsugi's "Hora" pose doesn't work as well as her "Peace" maneuver. Aw. Still cute as a button. Well, as cute as an undead doll wearing galoshes can be. I wondered if Yotsugi could do that point and lift act with anyone else besides Kagenui. Question answered! Ha! 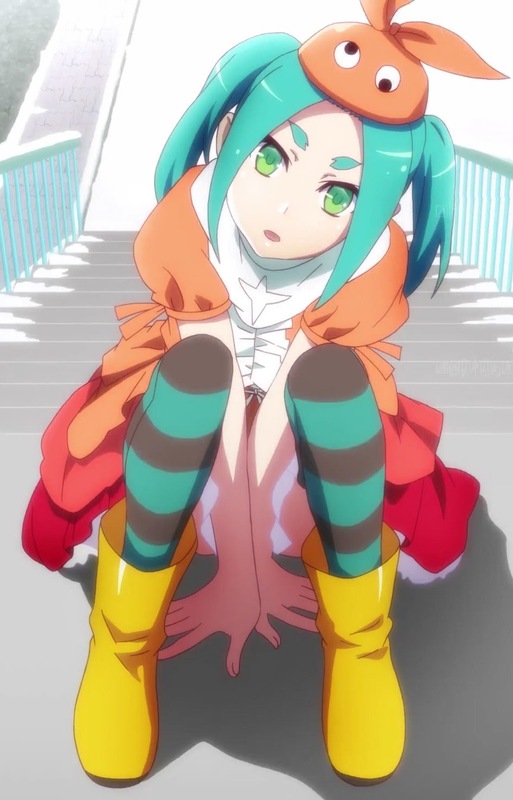 Here, have Yotsugi's pivot with an Araragi side dish. Hanekawa looks like she's having a nice time on her big trip. Hanekawa must be feeling relaxed without having to dye her hair everyday.